ConceptDraw MINDMAP enables you to present information as a visual map taking full advantage of pictures, symbols, text and the color, to make documents easy to comprehend and remember. 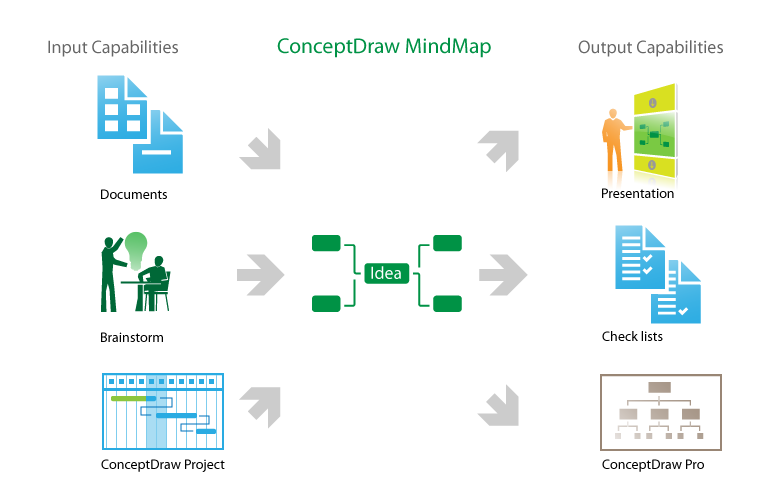 ConceptDraw MINDMAP provides versatile integration with MS Office and project management software along with complete support of mind mapping and brainstorming techniques. The role of ConceptDraw MINDMAP is to organize and plan idea development and communicate between process participants. Mind maps are convenient to prepare presentations for team and management and send task lists and related information. A unique combination of ConceptDraw MINDMAP and ConceptDraw PROJECT forms the creative environment for the team working. Helps you generate ideas and then discuss them in a group. When session is complete use Map view to discuss, edit, develop, remove or organize your ideas. The timer lets you limit the length of your brainstorming session. The Outline and the Map views can be presented simultaneously thus letting you easily switch between the map and its textual description. Any changes and additions immediately appear in both views. You can create mind maps that contain tasks with specific parameters: Duration, dates, percent completed, executors etc. Any topic can be turned into a task. Each map may have several pages, connected with hyperlinks. It means you can create a highly-detailed multi-level maps. Multiple pages preview with possibility to navigate between pages and documents Powerful tool to effectively manage info overload. Customizable toolbars and floating windows allow you to organize your workspace so that the necessary buttons are close at hand. On adding new branches there is no need to move them manually as they are automatically placed in a workplace separately. By clicking once on the corresponding icon you can arrange your mind map in different directions. Supply additional information where needed using text notes that can be easily added and edited within a floating dialog. When exported to HTML, notes come up as hints in the browser. Allow adding your comments to the topics, placing random ideas that do not concern the map subject matter outside your map and then go back to these ideas later. Rectangle: using this tool you can draw simple charts and diagrams on a map. Ellipse: great tool for creation of topic boundaries or highlighting important part of the map. Line: you can draw lines and several types of arrows using this tool. Export/import facilities enable you to export task list to Microsoft Project XML, file format compatible with almost any project management tool available. Also, you can import Microsoft Project XML files. Export to HTML lets share your document with large amount of people using Internet. You can seamlessly open files created by MindManager users on both Windows and MacOS. Export to PDFUsing PDF you create compact and platform-independent documents that can be freely viewed on any computer. OPML is the common data exchange format between number of outlining and mind mapping applications. Use it to exchange data with users of other software packages. You can export your maps into number of popular image file formats: BMP, JPEG, GIF, TIFF, PNG. Use this feature for transferring information about tasks and events that is contained in a map into iCal. Microsoft PowerPoint®: export to Microsoft PowerPoint® lets you easily create animated presentations for the colleagues based on your maps. Microsoft Project®: use MS Project XML export feature create project documentation based on project plans created in ConceptDraw MINDMAP You can also import your projects and view them as a mind maps. Microsoft Word®: create concepts and project plans using export of the map outline to the MS Word rtf file. Microsoft Outlook®: MS Outlook task list export/import helps you to manage your schedule and to be better organized. ConceptDraw MINDMAP supports both Macintosh and Windows platforms. It solves a problem of information exchange between two platforms, by allowing user easily to transfer files between a PC and Macintosh. Export of mind map text notes and outline text to iPod allow them to store plans and tasks outlines or other valuable information usually contained in notes. Converting mind maps into slideshows that are synchronized with iPod makes it possible to view maps on the move and make presentations for friends and colleagues. Create a project from an entire mind map using "Open in PROJECT" command. Project will contain project information initial that mind map contains: project structure, task structure, task information, resources. The multi-page mind map turns to a multi-project document. Create a project from selected topics using the "Create Project" command. Mind map will preserve all related project information. Paste copied projects, resources or tasks into ConceptDraw MINDMAP to obtain clear and visual representations of your project. ConceptDraw MINDMAP v10 an Alternative to MindJet MindManager - The power, economy, and versatility of ConceptDraw MINDMAP v10 takes personnel and team productivity to another level. Discover today what this means to you. ConceptDraw MindMap benefits comparing to Mindjet Mindmanager: Economical. (Lower license price, support is no charge maintenance is an optional one-time fee that delivers to you the next major release) ConceptDraw products are structured to save you money from the date of purchase for the life of the product. When you compare ConceptDraw MINDMAP v10 to Mindjet Mindmanager the cost savings will be obvious. Flexible Licensing. ConceptDraw is licensed per-named-user. Want ConceptDraw on 2 PCs, 2 Macs, or a PC and a Mac? Straightforward licensing makes this easy. The Affinity Diagram shows the structure of large, complex factors that have an influence on a problem, and then divides them up into a smaller and simpler structure. The Affinity Diagram does not show a causal relationship between the factors. This diagram is designed to prepare the data for further analysis of the cause-effect relationships. You will be able to use a Note Exchange solution to share mindmaps and mindmap data across your entire organization. It has never been easier to run brainstorm ideas for building strategies.